Trade binderies like Central Bindery in Phoenix, which installed a Kolbus KM473 adhesive binder, provide special finishing services. 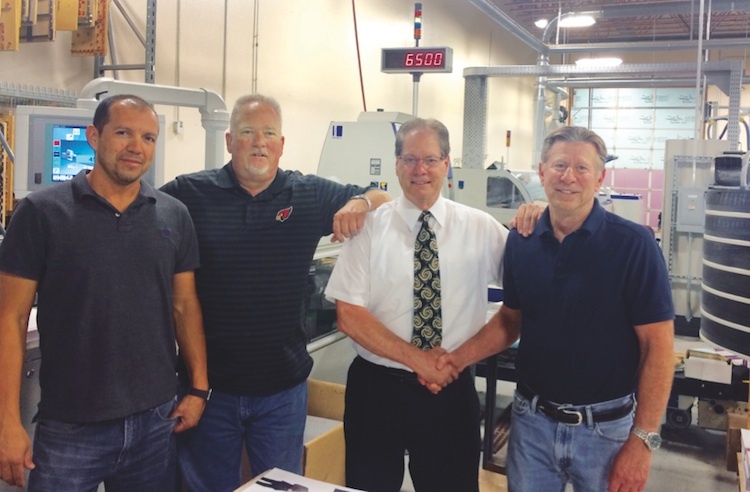 Central Bindery Owner Andy Delph (left) stands with Kolbus America’s Andy Hergenrother and members of the KM473 adhesive binder operating crew. Trade binderies are to the printing industry what tires are to a car. Printers print a lot, but the true Houdinis of finishing reside in the many trade binderies that dot our landscape. This is not to disparage the many terrific print shops out there. Today’s printing establishments employ lots of advanced finishing systems in their plants. But for trade binders, finishing is their entire business, and they probably (routinely) face more finishing problems in a week than many printers may see in a year or more. In addition, they will provide “boutique” finishing services that most printers could not afford to — such as book sewing, paper drilling, library binding, tipping,and more. Even so, trade binders are under tremendous pressure these days. The digital revolution has upset many of their apple carts. This, and a number of other factors, are causing business to fall off. Digital printing is increasingly integrated with finishing. New finishing options have been modeled to become a part of the press. So work that would be sent out in the offset days, now gets done in-house. Another issue is the almost scary automation of bindery and digital finishing systems. Modern folders, binders and stitchers can be fully integrated with web unwinders and cutters. The makeready that once took a bindery craftsperson some hours, can now be executed in minutes (or less) via a file-based instructions. Central Bindery in Phoenix has managed to both survive, and even thrive, in this environment. Started 31 years ago, Central has evolved into a broad-based trade bindery offering traditional and not-so-traditional services. Along with folding, perfect binding, saddle stitching and all forms of mechanical binding, Central Bindery offers pharmaceutical folding, round cornering and shrink wrapping. Owner Andy Delph has “seen it all” since its startup, and he and his team have had to adapt to many challenges and opportunities. Besides adding (or dropping) additional finishing services, trade binderies have to consistently invest in their equipment. Just like presses, older finishing machines will show their age and not be able to produce the work competitively. But newer, high-speed finishing systems are quite an investment, sometimes costing well more than $1 million. Central Bindery was facing this dilemma with an older large perfect binder that did not lend itself to short-run book production. Central had invested in a smaller, four-clamp binder for short-run digital work. But it lacked a system that could perform well for high-quality, long-run perfect binding and double (when needed) for shorter runs. Delph and his team had been kept up-to-date on what was going on at Kolbus America by their sales rep, Andy Hergenrother. Kolbus’ KM473 combines speed (up to 8,000 books/hr.) with extremely high system automation. After a trip to Kolbus in Germany, Delph made the decision. The binder was ordered with a 20-pocket gathering station and the latest three-knife trimmer. The older generation of adhesive binders were fast, but were definitely not short-run machines. The latest high-speed adhesive binders — the KM473 among them — are a different breed. Software is as much a part of the modules as is the metal. Operators mainly interact with the binder via a touchscreen. The binder has integrated quality control systems which ensure that an incorrect signature will not get processed. When the binder speed is changed, all subsystems (such as the milling station) react to make sure that they are running in proper relation to the binder speed. The cover feeder enables cover-to-book block registration to within 1⁄32˝, while the side gluing system can adjust the width of the glue so book “hinges” are crisp and good-looking. Another advantage is the KM473’s ability to quickly switch between adhesive types. PUR adhesive has emerged as a must “go to” for bookbinding in recent years due to its ability to create a strong bond with almost every digitally-printed sheet. Trade binders need a machine with the ability to go from EVA to PUR (and back) as quickly as possible. The very high level of automation of the binder and three-knife trimmer (Kolbus Co-Pilot system) yielded an unexpected benefit. It was not only suitable for long runs, but for short runs as well. It offered an option over the short-run, four-clamp machine that Central Bindery used for digital work. It also offered a dial-in network connection for remote troubleshooting and diagnosis. A trade binder today has to think long and hard before making a major capital equipment investment such as this. But, in the end, Delph and his team believe they made the right choice. The purchase has made them the largest perfect binding shop in Arizona. Not only that, it was a hit with clients in California, expanding their customer base. Trade binderies continue to face a tough environment. But (like printers), the ability to adapt and invest wisely will determine who stays and who goes in this changing business.